The Beyond 8ft (2.4m) Series Surf Leash is used in Surf Schools. Shop / Surfboards and Accessories / Leashes / Beyond® Surfboard Leash – 8ft school. 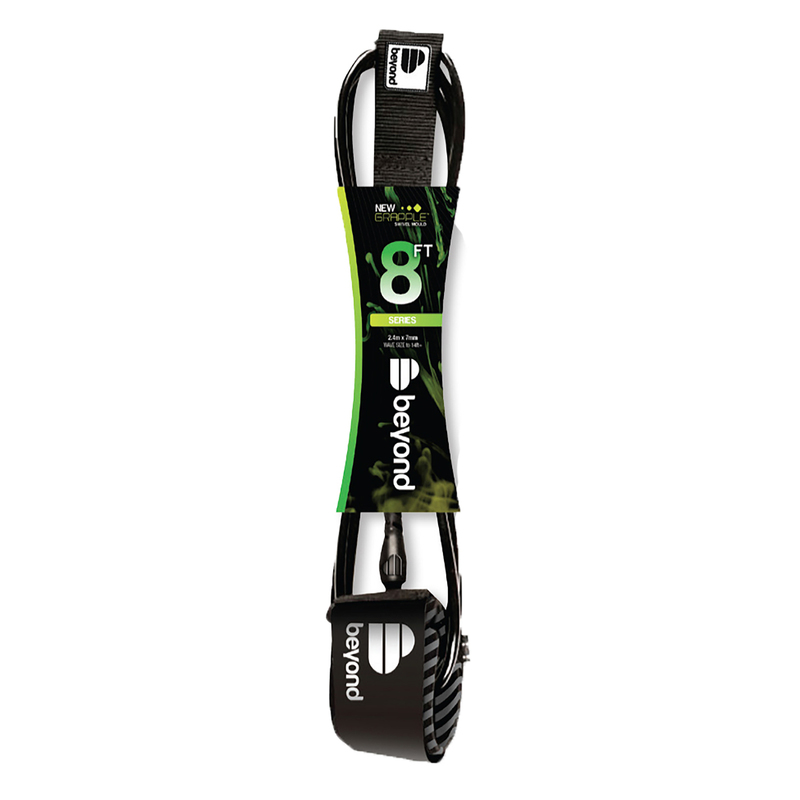 Beyond® Surfboard Leash – 8ft school. Designed for use in Surf Schools where security and hard-wearing qualities are prime requisites, the Beyond® 8′ School Series leash is ideal when surf security is paramount. Our leashes feature the engineer designed Grapple™ moulded anti-twist connector, spreading stretch load over greater distances, dialling out areas of weakness and giving you total security where it’s needed most. Scientifically engineered for reduced breakage with the best urethane cord we can buy. Sold without packaging. Trust when you need it. Beyond® Accessories – Far Beyond the Expected. Ultra strengthened 7mm urethane cord. Designed for use in Surf Schools, and used widely in French surf schools, where security and hard-wearing qualities are prime requisites, the Beyond® 8′ School Series leash is ideal when surf security is paramount. Perfect for families, or for Seasoft Softboards. A simpler design, our leashes still feature the engineer designed Grapple™ moulded anti-twist connector, spreading stretch load over greater distances, dialling out areas of weakness and giving you total security where it’s needed most. Scientifically engineered for reduced breakage with the best urethane cord we can buy. Trust when you need it. Beyond® Accessories – Far Beyond the Expected. Even our packaging is ‘Kinked’ so your leash isn’t. Its designed to reduce kinking and tangling by allowing the leash cord to hang in a fuller arc.